The 1951 season was a good one in Vandalia.. Led by seniors Dale Price, Powell Toth, Bob Anthony, Scotty Birchfield, Larry Furrow, Dudley Mook, Art Haywood, John Harley and Art Bryant. Anthony, Toth and Howell would be named SWBL All-Star Teamers, while Price, Birchfield and Furrow earned SWBL Second Team honors. Powell Toth was named Most Valuable Player and would go on to become the Aviators' next head coach just six years later. 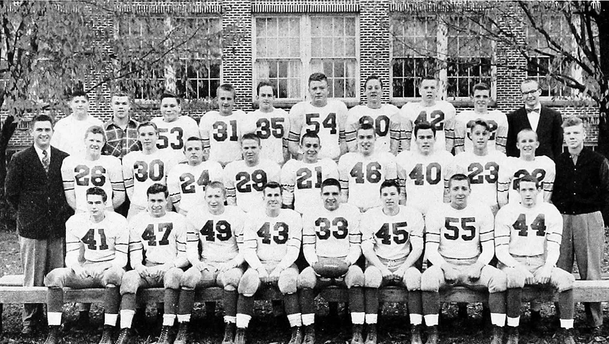 Butler opened the season at home, playing host to Fairborn on September 14, 1951. The Aviators had no answer for the Flyers' aerial and ground attack, falling 25-14. The next week found the Aviators on the ropes once again. Madison took advantage of an early turnover and a long touchdown run to take an early 13-0 lead. Butler's Dave Smith found paydirt twice and the sure footed Toth connected on two PAT's to give Butler the 14-13 win. The upset of the season followed as Butler traveled north to face Milton-Union. Much like the week before, the Bulldogs jumped out to an early 13-0 lead. Despite the fact that it was merely the third game of the season, it was a game with championship implications. Sensing the urgency, Butler rallied from behind to pull off the 20-19 upset victory. It was a win that would set the tone for the Aviators. "That game won the league for us," Butler head coach Art Bussard would later recall. On the 5th of October the Aviators tussled with arch-rival Northridge, only to be overwhelmed by the Polar Bear's powerful, clock chewing offense. Butler would fall in a one-sided 19-0 affair. The Aviators came out of the Northridge game banged up, and took an undermanned squad west to Eaton the following week. The defense of Larry Furrow and the smooth running of Dave Smith paced the Aviators. Smith's two touchdowns would prove to be the difference in Butler's 20-12 win over the Eagles. A budding rivalry with neighboring Randolph soured even further, as Butler spoiled the Bobcats' perfect season with a 25-14 win. Smith and Toth paced Butler with two touchdowns each. West Carrollton came calling a week later, and the Aviators' treated a large homecoming crowd to a resounding 20-0 win over the Pirates. The SWBL Championship was wrapped-up a week later at Tippecanoe. What was anticipated to be an entertaining game was completely derailed due to winter weather. The conditions forced both teams to play conservative football, and in spite of Price finding paydirt twice, Butler had to settle for a 12-12 tie to end the season. The championship season was a big one for the Aviators as it marked the first league championship for Butler in nearly 15 years. The sights were now set on 1952.